This thoroughly researched biography, commissioned by Verna Fine, widow of the composer, is a highly readable entree not only to the life and works of Irving Fine, but to the history of the Brandeis University Department of Music. Irving Fine was a highly creative and innovative composer, and became the Walter W. Naumburg Professor of Music and Chairman of the School of Creative Arts at Brandeis. His inventive leadership of a newly formed Creative Arts Department would set the tone and course of study for the next 50 years. Fine had taught theory and music history at Harvard from 1939-50, when he joined the music faculty of Brandeis in Fall, 1950, as Lecturer in Music and Composer in Residence. Fine’s intellect led him to a style of “Stravinskian neoclassicism and romatically inflected serialism” that was to catch the imagination and close friendship of the American musical luminaries of the day, including Boston Symphony conductor Serge Koussevitzky, composers Aaron Copland and Leonard Bernstein, and his Brandeis colleagues Harold Shapero and Arthur Berger. Despite his later forays into serialism, Fine retained his melodic muse. It seems that only his early death in 1962, (he was not yet 48 years old), prevents him from being remembered today in the American imagination in the league of company of his contemporaries who lived into old age (who had more time for more creative output). Yet, Irving Fine distinguished himself early enough to be highly regarded. 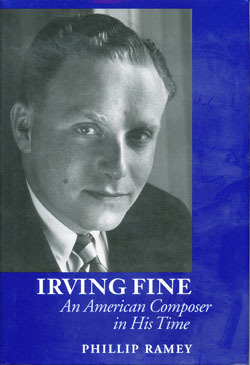 As Ramey says, “Fine’s small but estimable output reveals a composer who was a perfectionist on the order of Copland and Stravinsky.” Fine’s papers reside at the Library of Congress which has a special online exhibit on the project American Memories on the life and works of Irving Fine. The author, Phillip Ramey, has also written a brief biographical essay for the Library of Congress website. Irving Gifford Fine was born 3 December, 1914, the son of George and Charlotte (Lottie) Fine who lived in East Boston. George had been trained as a lawyer at Boston University Law School but became more involved in stock market investments than law. Lottie was a housewife with three children, including Fine’s sisters Audrey and Barbara. From an early age, Irving showed talent in music and studied piano with Frances Grover who had been a student of Randall Thompson. She encouraged Fine to think about Harvard as a choice of college. He attended Winthrop High School and then completed a year at Boston Latin to qualify for admittance to Harvard, where he began in 1933. His father’s disapproval of music as a career for his eldest son had forced Irving to enroll as well in science courses. Eventually Irving dropped science for other pursuits. While at Harvard, Fine served as pianist for the Glee Club, and occasionally played as accompanist for silent films at the Cambridge movie house to make some extra money. At Harvard, Fine recived the best education then available in music theory and history. His studied theory and composition with Walter Piston; choral conducing with Archibald Davison, orchestration with Edward Burlingame Hill, and counterpoint with Arthur Merritt. At Harvard, Fine was to meet musicians with whom he had life long relationships, including Harold Shapero and Arthur Berger. In his junior year at Harvard, he was elected vice-president of the Harvard Glee Club. Being an officer of a club usually meant a student would be accepted into the Harvard Club of Boston. This organization had no direct link to the University, but it was a usual path at that time to accept club officers. In the summer of 1937, Irving received an invitation to join. At the interview, he was shocked that they told him “we really don’t take your kind.” It was his first direct encounter with blatant anti-Semitism that had permeated much of Harvard society for years. Even later in life he was outraged. Irving continued at Harvard to study composition for graduate work in the fall of 1937 after graduating with his BA that Spring. He learned elegant craftsmanship, which was to become a Fine hallmark, from Walter Piston. In Feburary, 1939, Nadia Boulanger came to teach at Radcliffe (being a woman she could not be on the faculty at Harvard). Fine was able to study with her, and it had a profound influence on his work, most especially his lifetime fascination with the work of Stravinsky. Boulanger was impressed enough with Fine to invite him “to continue his work with her in France on a Wyman Foundation grant, during the summer.” His studies with Boulanger provided him with solid foundations, helping him to crystalize his technique, and attain a “clarity in music, an element that would strongly manifest itself in all of his mature scores.” The primary ingredient Boulanger gave Fine was confidence. She gave him the encouragement he needed to continue. Fine had plans to continue another year in France, (even convincing his father), but by October, the Nazi advances made staying in Europe too dangerous for Fine. He returned to Boston. In the Fall, 1940, Fine began to teach at Harvard. That year Stravinsky came to the campus and Irving was able to get to know him. That same year he met Verna Rudnick whom he later married in the summer of 1941. He continued as a teaching fellow at Harvard and also conducted the Harvard Glee Club. During World War II, Fine was found to be 4F due to a concussion he had endured earlier in life. He was unable to serve in the Army and lost his Navy commission due to medical disability. For a while during those years he worked with Maynard Kaplan to write popular songs a la Rogers and Hart, but the songs never made it and were never published. Part of Fine’s fasination with musicals came from enjoying a good tune and part of it came from his assessment that Bernstein had been right that the American public ‘didn’t care for symphonies’ much. His debut came with incidental music to a theatrical production of Alice’s Adventures in Wonderland in 1942. Fine also paid close attention to his undergraduate students at Harvard, and even started some music clubs. He often invited some of the talented students to his home, and he was very popular with the students. In 1943-44 Aaron Copland came to Harvard, and it was the start of a life long friendship between the two. Another composer friend was Lukas Foss who was also involved in the “neoclassic Stravinsky” style. Ramey’s story of Fine’s life delves into both personal and professional depth. He includes family anecdotes and friends’ reminiscences. In addition, there are many moments of analytical candor about the mans’s life, giving a realistic picture of both Fine’s strength and weaknesses. Ramey continually inserts musical analysis throughout the book, but there are no musical examples. As the pieces themselves enter Fine’s life, so do we learn of his musical techniques, fears, jealousies and triumphs. Fine was a slow and meticulous worker, often prone to self doubts and second guessing. His finely crafted technique is on display in early works such The Choral New Yorker, finished in 1944, and A Short Alleluia in 1945 (published posthumously in 1973). His completed output was small, not only due to heavy teaching loads including the Basic Piano course at Harvard, but with myriad conducting and club duties. He was an engaged teacher who gave ample time to students. Fine also had emotional difficulties stemming from an ever increasing depression as well as the life long suffering from severe headaches stemming from his early accident. Ramey’s descriptions and analyses of Fine’s works may be one of the most lasting contributions of this volume. They will certainly be the starting place for any future student of Fine’s music. They are stated in clear, fine style themselves; Ramey’s language and tone often reflecting, in a way, Fine’s music itself, yet keeping a certain emotional distance. “An impartial appraisal of Fine’s violin sonata would have to note that it illustrates the tenet that his problem as a composer was never one of technique but rather of personality. Although some of the romantically soaring violin lines are unlike anything found in any of its avatars, as are occasional harmonic complications, at no point does a clear voice emerge,” Ramey writes. Ramey, a composer himself, seeks the soul of the man through the music, but finds only a complex package of both high achievement and the ever-to-be-unrealized, probably unattainable, perfect expression for Fine. Ramey relies heavily upon the primary sources, interviews and written documents. He never leaves the objective biographer’s role, yet his sympathy for the man is evident throughout in his writing. He is making Fine’s case as a great composer, in the absence of Fine, yet always acknowledges the shortcomings as well as the clear genius. In 1948, Fine’s job at Harvard was up in the air. Either he would be given a promotion or have to leave. In the end, Fine along with many of his friends, felt that the anti-Semitic atmosphere at Harvard contributed greatly to the decision not to promote him. Many attributed this especially to Randall Thompson, of whom Milton Babbitt has said “was an official anti-Semite– that I can vouch for– and a curmudgeon.” Additionally there were other issues, including that Fine had organized successful concerts and was extremely popular with students. However, Leon Kirchner pointed out that the faculty simply wasn’t interested in a performing orientation for the department and that Irving was considered an “empire builder.” Whatever the internal political reasons, Fine was rejected for tenure. The bright spot of that year was Fine’s composing Partita for Wind Quintet, which went on to become a staple for woodwind groups. Winning a Fulbright in 1949, Fine went to Paris to investigate post-war French music and took his family. In the meantime, Fine had been approached by the nascent Brandeis University even before the decision at Harvard went through. In September, 1950 Fine became the second member of the music faculty with title of Lecturer in Music and Composer in Residence. Fine helped build the department of music at Brandeis and had huge opportunities. In his second year there, his survey course in contemporary music had visiting lectures by Copland, Roy Harris, William Schuman, Lukas Foss, Marc Bltizstein and Rene Leibowitz. Copland and he co-taught a class entitled “The Anatomy of Twentieth Century Music”. In March, 1951, Fine’s Notturno premiered at Jordan Hall in Boston. It was to become one of his most popular orchestral scores. Fine recruited Bernstein to commute to Brandeis one day a week to lecture. Fine insisted that “Music is something to be made and played.” Under Fine’s leadership, in a few years Brandeis was able to open the Slosberg Music and Arts Center with recital hall, facility offices, studios, classrooms, practice rooms and a library with recording and transcription alcoves–all facilities showing a commitment to performance as well as musicology. Not least of his accomplishments at Brandeis was the creation Spring Arts Festival which was the first of its kind in the country. The importance of these festivals to Brandeis in its early years can not be underestimated. It brought incredible credit and publicity to the University in addition to the fine programs of music art and theater with positive national attention. The Spring Arts Festivals, envisioned by Fine and Bernstein helped to define Brandeis University in the public mind as on the road to a future as a top echelon university. In 1952, Fine became the Chairman of the Council of the School of Creative Arts which covered music, theater and fine arts. Some time in the 1950s Fine’s music moved into a serial technique, especially with his String Quartet (1952) and Fantasia for String Trio (1956). His adoption of twelve tone technique never totatlly supplanted his love for melody. He didn’t wish to follow strict rules. For Fine, “Music must sound. The most important thing is what you hear.” Ramey relates in detail Fine’s growth into a mature artist, with his last work being his Symphony, one of his most ambitious pieces. This all ended suddently with Fine’s untimely death from a massive heart attack shortly after conducting at Tanglewood, on August 23, 1962. Among Fine’s many honors during his lifetime were two Guggenheim Fellowships, a Fulbright Research Fellowship, a National Institute of Arts and Letters award, and a New York Music Critics’ Circle award. After his death, many composers, some of whom were personal friends, wrote works in memory of the composer. Ramey’s book includes a chronological list of completed works of Irving Fine, along with an index of his compositions. With that we have a good look at the life of Irving Fine. Unfortunately, there is no discography listed in the book, which is the biggest criticism of the book. Additionally, there is a lack of musical examples to accompany the many fine descriptions of works embedded throughout the book. JMWC highly recommends this book for public, Jewish, and academic libraries. This book received the 2006 Nicolas Slonimsky Award for Outstanding Musical Biography from ASCAP.